The installation ‘372.835 words about climate’ came into being through an artistic collaboration between dramatist student, Marie Bjørn, artist, filmmaker and founder of Other Story, Madeleine Kate McGowan and production leader at NXT and Dome of Visions, Nikoline Kern. 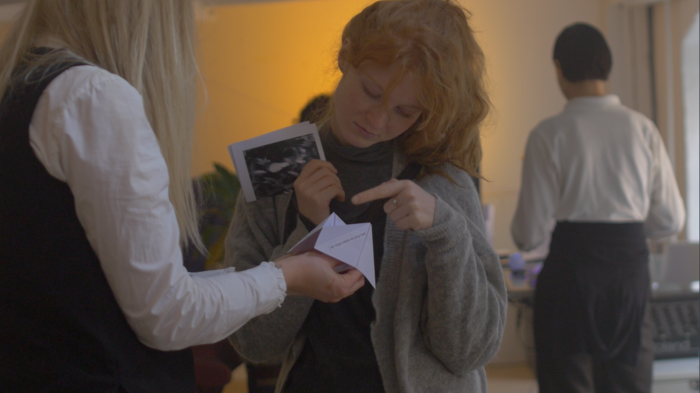 Activated by Marie Bjørn’s residency at Other Story, where she interviewed fourteen different people, a witch, a biologist, a performer among others, and asked them questions such as: “What is Nature?”, “If Nature had a voice what would it say?”, “Can jellyfish fall in love?”. The answers were installed as long text threads in the NXT space and from this body of text, ten young artists interpreted and created art pieces, which were presented on this day. To describe such a complex installation, the strongest documentation is possibly the reflections of the guests who experienced it. So we invited one of the guests, young philosopher Daniel Frank Christensen to write about it. Written by Daniel Frank Christensen, Philosopher (Ma in Philosophy). On Sunday the 10th of March 2019, with five days up to the planned global school strikes protesting inadequate political and commercial climate change mitigation efforts, Copenhagen-based Other Story staged an inspiring Youth Climate Revolt performance exhibition at NXT; a base-line melancholic and yet reaffirming, bubbling taste of insurrection. I travelled toward NXT through Copenhagen that early spring day amid the darkest of rainclouds and abrasive hailstorms, burdened in a crisis simultaneously rooted in personal, existential, relational, political, social, functional, biological, and aesthetic dilemmas. I thought I might briefly and politely have a look at the exhibit, talk to my hosting friend about a sensitive practical matter and then depart. Although when I arrived at NXT, a centrally located project space nestled in the backyard of Copenhagen’s Gammel Strand quarter, I felt myself and my woes melt into in a complete sense of collective thematic resonance. I climbed the ladder leading from the foyer to the first story – a white repurposed office space enveloped in smoke machine mist and soundscapes – and was greeted by a woman wearing a white mask, holding one of those origami tetrahedron fortune tellers school kids use. Text fragments were printed on the device’s leaves, which she folded three times following each of my selections. This seemed quite in line with many an opaque performance installation and I awkwardly resisted passing into emersion, but then again, I hadn’t really started paying attention. She then led me to a thick, whitewashed wooden structural beam featuring a string of type, and I began to read. Read the entire article and see more pictures taken by Other Story.